Really. A haiku is about all I can produce in this state of bliss. Okay, two haikus. It's true. To me, the only thing better than a freshly baked croissant is a freshly baked almond croissant. But that's for another day. Until then, I'm off to bask in the glory of one of the most perfect breads on earth. Pour milk in the bowl of an electric mixer. Sprinkle in the yeast and let it sit until it begins to get a bit foamy, ~5 minutes. Add salt, sugar, and 4 cups of the flour and mix on low, using the dough hook, until dough is smooth, ~7 minutes. Add in a bit more of the flour at a time if the dough is too sticky to pull away from the sides of the bowl. Dough should be soft, but not too sticky. Turn dough out onto a lightly floured work surface and knead for a few minutes. 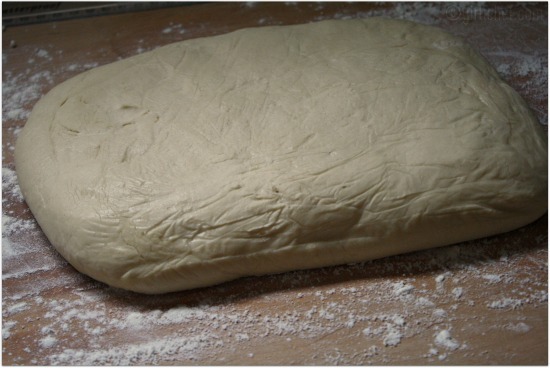 Shape dough into a rectangle, ~1½" thick. Wrap in plastic and chill for one hour. Meanwhile, place the cold butter between 2 linen towels and beat it with a rolling pin into a rectangle that is approximately 5 x 8 inches. If you can, buy your butter in a one pound block and cut off a quarter of the block (lengthwise) in order to get the twelve ounces that you need. Now take your twelve ounce block of butter and cut it into thirds lengthwise. Set each "slice" next to the next on top of a sheet of wax paper or plastic wrap. Now set another sheet on top of the butter and roll out a couple of inches each way. This is a SUPER easy way to get your sheet of butter ready. 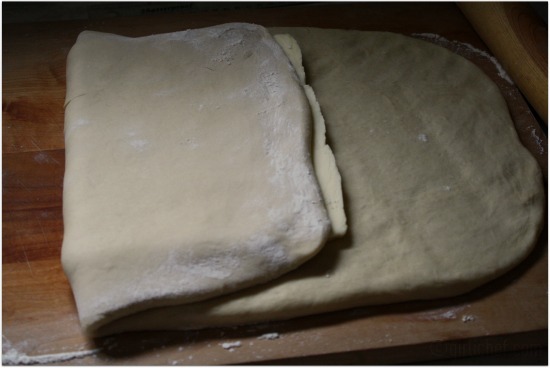 On a work surface, using as little flour as possible, roll the dough into a 10 x 16 inch rectangle, ~½" thick, lifting and stretching the corners to help maintain a rectangular shape and even thickness. Working with the long side of the dough parallel to the edge of the work surface, place the sheet of butter in the middle of the dough. Fold the dough on the left over the dough and then fold the dough on the right over that, just as you would fold a letter. 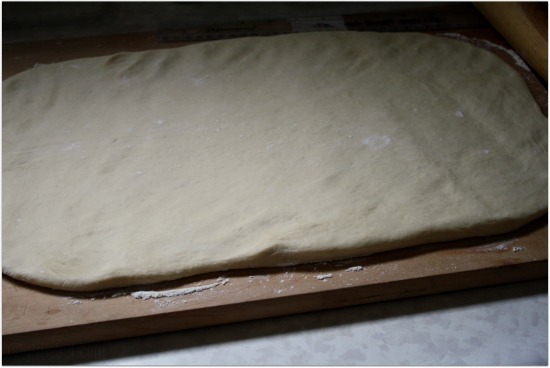 Roll the dough out into a 10 x 15 inch rectangle, ~½" thick. If any of the butter oozes out, just sprinkle it with a bit of flour to keep it from sticking. 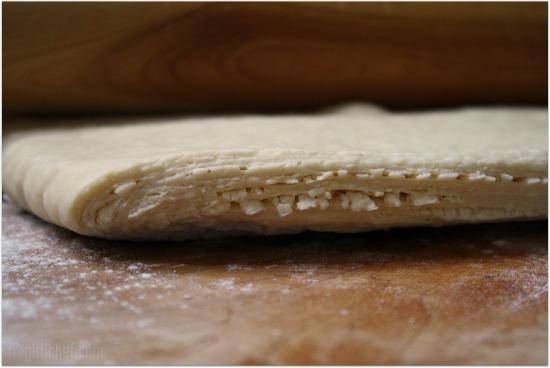 Again working with the long side of the dough parallel to the edge of the work surface, fold the left side over two-thirds and then fold the right side over to meet the left edge, stretching the corners and squaring off the sides so the edges line up evenly. This is your first fold. Wrap in plastic and refrigerate one hour. On a lightly floured surface place the seam up and to the bottom. 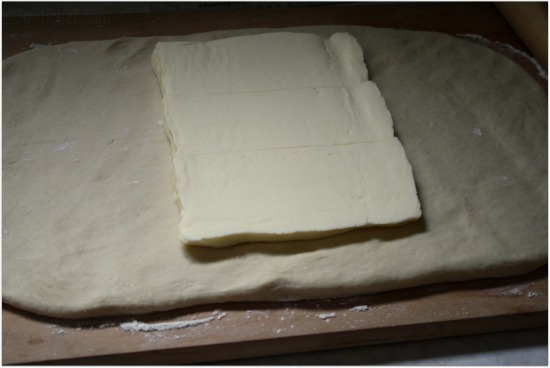 Roll the dough out into a 10 x 15 inch rectangle, ½" thick. Fold in the same letter-fold manner, left over two-thirds and then right to meet left edge, stretching and squaring. This is your second fold. Wrap in plastic and refrigerate one hour. Repeat rolling, folding, stretching, and squaring process as above. This is your third fold. Wrap in plastic and refrigerate one hour. Repeat process one more time for your fourth fold. 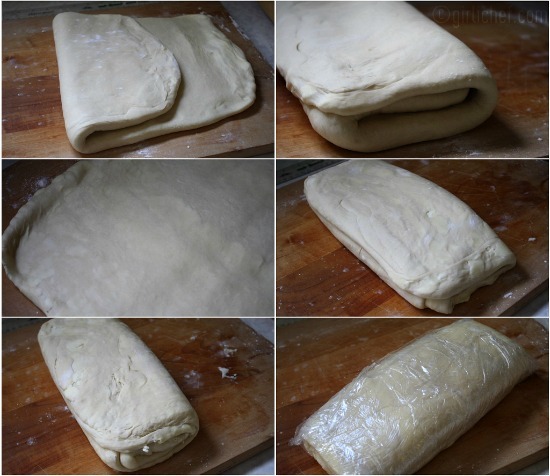 After this fourth fold, wrap tightly in plastic and refrigerate for 3 hours or up to overnight. 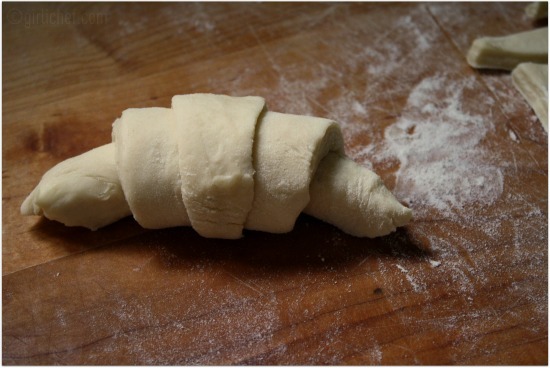 To shape croissants: Divide dough in half and return one half to the refrigerator. 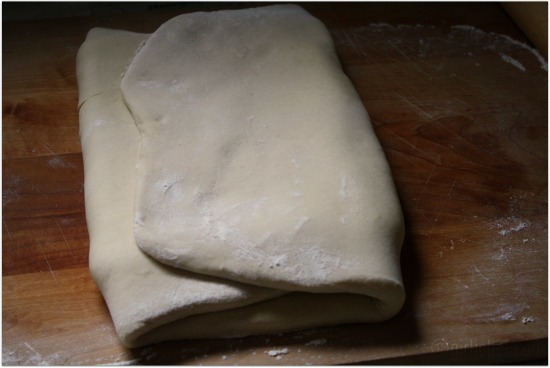 On a lightly floured work surface, roll dough into a 12 x 16 inch rectangle, ¼" thick, flouring surface as necessary, lifting dough and stretching corners to help maintain a rectangular shape and even thickness. Trim edges straight and brush off any excess flour. Working with the long side parallel to the edge of the surface, cut the dough down the center vertically and set one half aside. 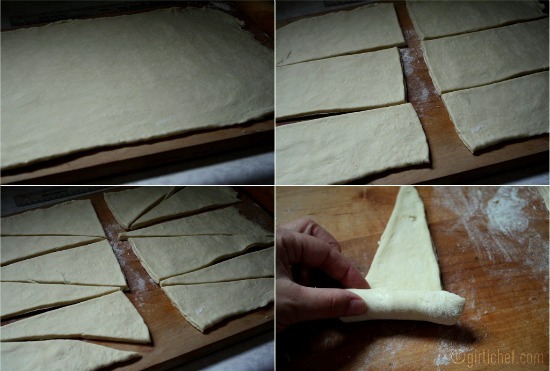 Place the longer side parallel to the edge of the surface and cut the dough vertically into thirds. Cut each third diagonally in half to make 2 triangles. You should have a total of 6 triangles, each with about a 4-5" base. Holding the base of one triangle in one hand and the top of the triangle in the other, stretch the dough to almost half again its length. Return the enlarged triangle to the work surface, keeping the widest end toward you. 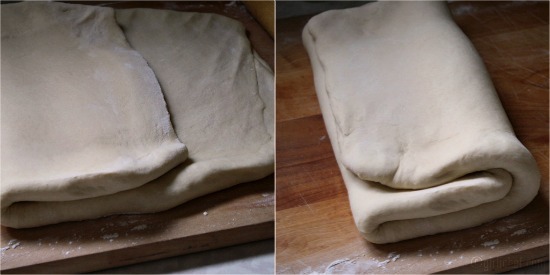 With your fingertips, tuck in the wide end of the dough to begin the roll. Continue rolling loosely toward the tip, using the heel of your hand to roll and creating tension by using your other hand to stretch the top of the triangle away from you. The dough should overlap three times with the tip sticking out from underneath. 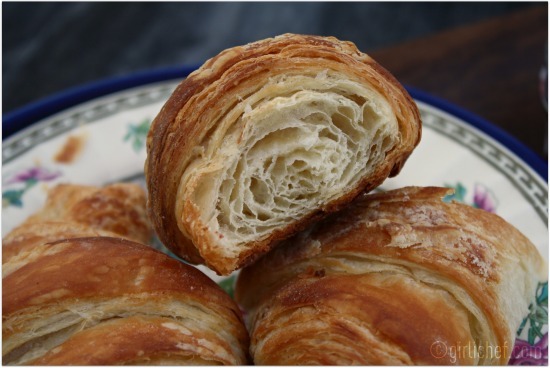 Place the croissants 2" apart on a lined baking sheet and curve the ends of the croissant inward to form a crescent shape. 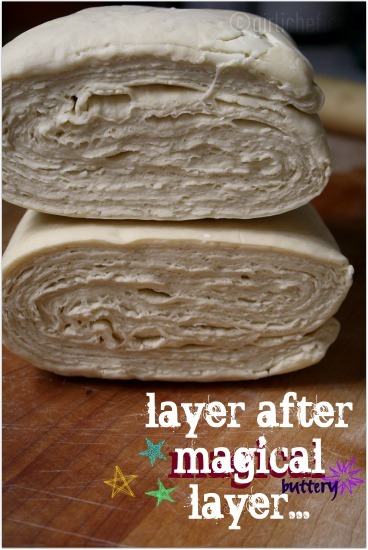 Repeat with other half of dough, using a second sheet, if needed. Set aside in a warm place to rise until slightly puffy and spongy to the touch, 2-2½ hours. Adjust oven racks to the lower and upper positions and preheat oven to 425° F during last 15 minutes of rise time. Open the oven door and spritz heavily with water from a spray bottle, and quickly close the door. Open the oven door again and slide the baking sheets onto the racks. Spritz the oven heavily with water again and quickly close the door. Reduce oven temperature to 400° F. After 10 minutes (don't be tempted to open the oven door before that), rotate the baking sheets, for even baking. 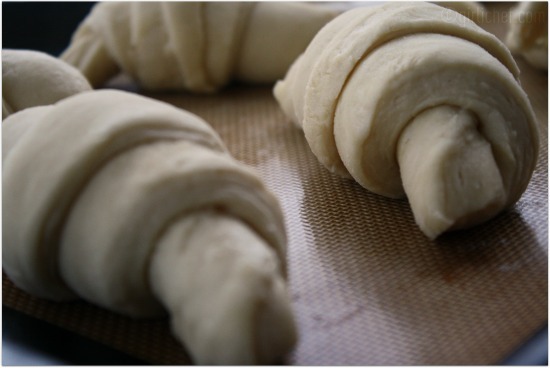 Reduce the oven to 375° F and continue baking until croissants are golden brown, ~8 minutes longer. Never in my wildest dreams did I think I could make croissants! Thank you, thank you, thank you for sharing this beautiful tutorial!! 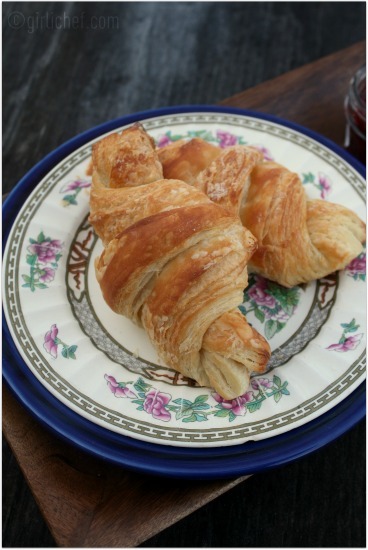 Gorgeous croissants! They look so good, very impressive, better than the bakery! I'm sure these were wonderful! And you can probably tell that I'm playing catch-up on my blog reading today! So beautiful and so yummy. The process of making it looks like an art on itself. Those flaky bits are my favorite. Perfect with a cup of coffee too. The LaBrea Baking book is one of my favorite backing cookbooks. Your croissants look fabulous. I just love that little Budda sitting in all those Cheerios, it made me smile! All those wonderful layers of butter so carefully rolled into a flaky pastry a thing of beauty. I can almost taste them. Thank you so much for sharing your fabulous recipe with Full Plate Thursday. Hope you are having a great week end and please come back soon. Oh I can almost taste those beautiful, buttery croissants and your haiku is delightful! BEEEeautiful job Heather! I'm impressed since I can't make anything at all with dough. Oh my! I am so impressed, I don't think I could do that, lol. Your croissants are gorgeous Heather! I'm swooning just looking at them! You have mad bread baking skills and make it look so easy. These couldn't be more perfect. 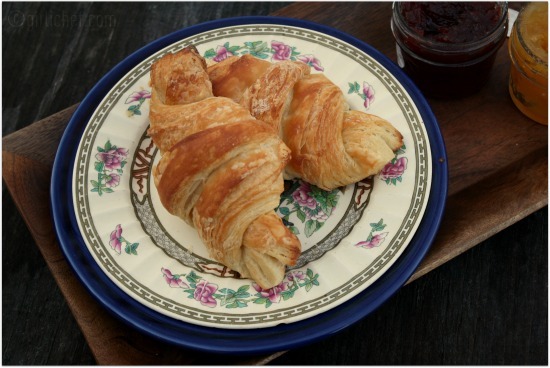 This takes talent and your croissants look divine. Congratulations! I've always wanted to learn how to make them. I've watch a few videos but your step by step was actually more helpful.Thanks for the great tutorial heather. I cannot BELIEVE you made these! They look amazing! Even its time consuming, its definitely worth to try na..super flaky croissants..
And to think you were once afraid of yeast...you go girlie!!! They're gorgeous, Heather - flaky, light, warming, inviting, buttery - and all that. They terrify me. Would you come to MN and bake some here? Free room and board. The lamination on these babies is really obscene amounts of perfect. Bravo! color me impressed! amazing job. 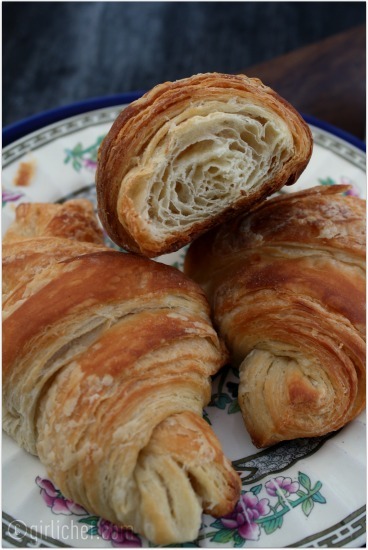 thank you so much for sharing your magical croissants over at Food Friday, Heather! Wow, look at all the air and flaky goodness in those things. They make that little Pilsbury doughboy feel inadequate, lol. These look UNBELIEVABLE! Wow, better than any bakery I've been to lately! I'm so wishing I had one right now with a cup of tea and some jam, mmm, mmm, mmm! You musta read my mind. I've been wanting to look up recipes for these. You totally rocked it out chicky! thanks for the post, YUM! Heather - the croissants look sooooooooooo delicious! I've never made croissants, but you definitely make me want to. Te han quedado perfectos, que buenos. These sure look difficult to make. But they look so beautiful. Delicious. Love the photographic tutorial Heather. Looks like you have been bust baking this week with another recipe from this special Game Changer. Except to say thanks for the step by steps--I need them! What an EXCELLENT tutorial. I would love to be enjoying one of these beauties. Aren't they the very best? Thank you so much for sharing this with me. I hope you have a lovely end to your week! That is buttery bliss right there. What a way to start the day! I'm sooo going to make these. Croissants are one of my favorite baked goods. I haven't had the ones from La Brea Bakery yet! I'll have to try them, I buy the bread from LBB sometimes at Ralph's...wonder if they carry those croissants there, too.